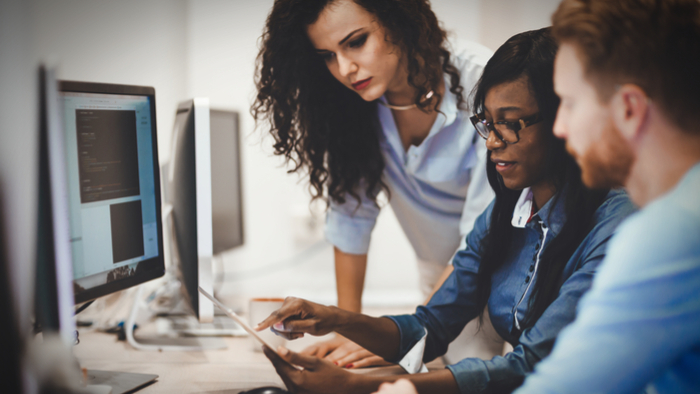 • A report highlighting the massive deficit of women in color at specific tech companies has inspired some companies to take specific actions based on the recommendations in the report. • In this case, knowledge of the problem spurred action, how else can research be used to inspire action? • Learn how increased diversity can fill the tech talent gap. Executives at tech companies say gender diversity matters. They opine that there aren’t enough women in tech, and express outrage and frustration that just 11 percent of senior tech leaders are women. But in reality they spend very little of their philanthropic dollars attempting to close this gender and race gap, according to new research released by Melinda Gates in partnership with McKinsey & Company. Last year, according to the report, only 5 percent of companies’ philanthropic giving went to programs that focused explicitly on women and girls in tech. And less than 0.1 percent of their grants went to programming for women of color—a group whose representation in tech is getting worse. Over the past decade, the ratio of black, Latina, and Native American women receiving computing degrees has dropped by a third, from 6 percent to just four percent. The companies investigated found that last figure so alarming that twelve of the 32 participants are taking immediate action. They’re uniting to form the Reboot Recognition Tech Coalition, a joint effort by companies like Microsoft, Qualcomm, and LinkedIn to close the gender gap for women of color in tech. They aim to double the number of underrepresented women of color graduating with computer science degrees by 2025, and they’re collectively pledging $12 million toward this goal over three years. This group will coordinate to direct their giving collectively, with the twin goals of creating a set of guidelines that will revamp the computer science major to appeal more to women of color and while building dedicated communities that will support these women within the industry, among other things. In addition to surveying companies about their existing strategies, researchers spoke with more than 100 leaders in the field to determine what strategies were proving effective. The resulting research forms a playbook for companies interested in promoting and supporting gender diversity more effectively. It includes tips for what makes programs successful, advice on how to pick and set a strategy that is in line with a company’s business objectives, and a self-assessment to help companies figure out whether their efforts are working. Read the full article about tech companies by Jessi Hempel at Wired. Women and Girls is a complex topic, and others found these selections from the Impact Giving archive from Giving Compass to be good resources. The new Women, Peace, and Security Index released at the United Nations highlights huge regional and global disparities in women’s well-being, as well as a continuing lack of gender-disaggregated data limiting analysis on key issues. The index identified Syria, Afghanistan, and Yemen as the least safe places for women, both in and out of the home. Meanwhile, some countries — including the United Arab Emirates and Namibia — strongly outperform their regional averages. A good way to complement your interest in Women and Girls is to connect with others. Check out these events, galas, conferences or volunteering opportunities related to Women and Girls. If you are looking for opportunities to take action and give money to Women and Girls, here are some Giving Funds, Charitable Organizations and Projects aggregated by Giving Compass where you can take immediate action.